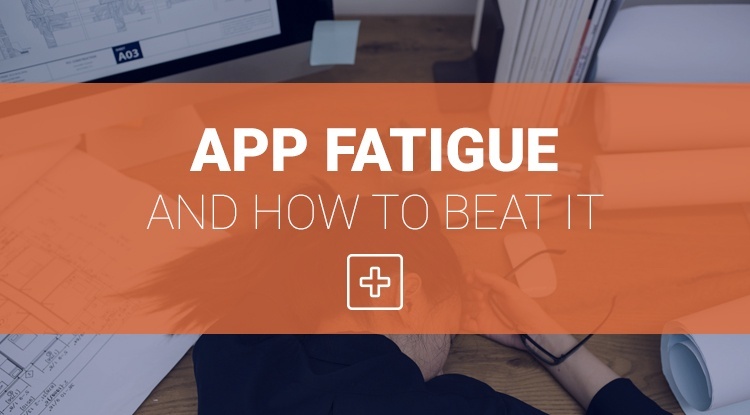 What is App Fatigue and How Can You Beat It? The accounting add-on industry is booming. New apps are popping up on an increasingly regular basis, addressing ever more niche elements of accounting and bookkeeping processes. With so many apps to choose from, how do you go about choosing the one that’s right for your firm? That is, without spending hours dredging through the depths of the internet and eventually banging your head against a desk. Here’s what app fatigue is, and how to beat it. ‘App fatigue’ is a phrase coined to describe how consumers are growing tired of apps: tired of choosing between so many seemingly identical options, tired of constant notifications, tired of having an app to monitor and dictate almost every part of their lives. While the phrase originally related solely to smartphone apps, KPMG predicts that the trend will creep into the accounting industry. The thing is, many apps are useful. They can save you time, improve the reliability of your data and give you the ability to expand your service offering. So how do you find those useful apps in the sea of available software? Once you’ve mapped out that workflow, you can see what it is exactly that your firm needs in terms of apps. And don’t be fooled, in order to keep up with your competitors you will need apps. Look for inefficiencies in your workflow. Some inefficiencies may be staring you in the face: manual data entry into your general ledger for example – it’s a time cost that you simply don’t need to be spending. Other inefficiencies may be more elusive: having multiple versions of documents floating around, causing havoc when it comes time to finalise and send. Not all inefficiencies are created equal. Look at which of these holes in your workflow are costing you the most time, people power and money. From there, you can sort the problems you wish to address by order of urgency and importance. Naturally, you should start at the top of the list and work your way down. You know what you’re looking to streamline with an app, so it’s time to start the hunt for that app. Get a feel for the market by talking to fellow accountants and bookkeepers about what they’re using, and check sites such as GetApp for reviews. When you’ve seen what’s out there, narrow down your options. Try to get to the stage where you’re choosing between only two or three apps. In order to do this, go back to those firm needs. How will this app fit into that flow of information? Are there certain features you require for your firm in particular? Once you’ve got your options narrowed down, the fun can begin! Make time to see the apps in action, and the best way to do that is through a guided demo. A free trial is all well and good, but a demo allows you a look around the interface, while an expert shows you the extent of what the app is capable of. Industry events and conferences are a great opportunity to get a demo – you can get to grips with the app in real-time and ask the difficult questions face-to-face with the vendor. If you can’t make it to an event, see if demos are available over a call or on a webinar. This isn’t a quick fix – you want to choose an app that will stand the test of time with a vendor that demonstrates a desire to innovate and continue to perfect their product. Sometimes the cheap option isn’t the best option – just as with a pair of shoes, the cheap option may look good in the short-term, but by spending a little extra, you’ll most likely get a lot extra in the long run. Your team needs to be on board – in reality most, if not all, members of your team are going to be using this app on a day-to-day basis, so it’s important to make sure that everyone is comfortable with the choice. You can go about making the decision however best suits you. Draw up a list of pros and cons, rate the apps on a scale of 1 to 10, make a list of criteria checkboxes – however you come to a decision, it should be final. Once you’ve got the app in your hands, so to speak, you can get working on implementing it in your firm’s processes. Make sure you throw yourself into the implementation process – getting the new software up and running should be a priority. If you’re feeling app fatigued after your decision-making exercise, rest assured that the benefits of your new software will quickly begin to reveal themselves! As we’ve said, one of the best ways to get a feel for a software is through a guided demo. If you’d like to eliminate manual data entry and constant client chasing from your firm’s processes, book in a demo with a member of our team, or attend one of our webinars to see Receipt Bank’s magic for yourself!